Culinary writer Mary Berry is one of the judges on the show. 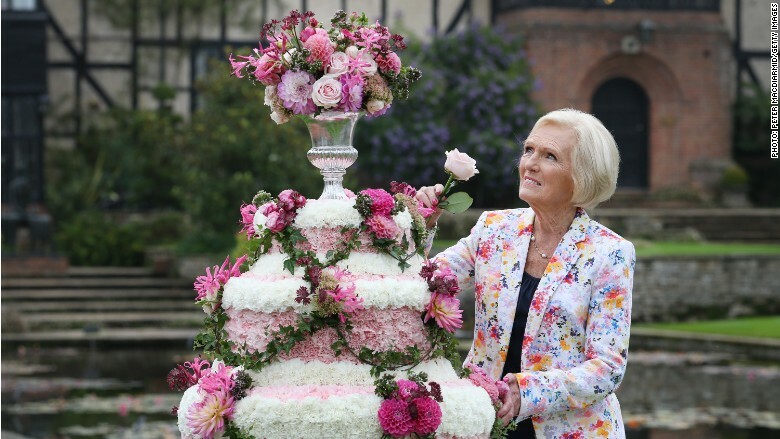 The most watched British TV show of the year is about baking. Really. Not soccer, not an election debate. Cakes. The final episode of the BBC cooking contest "The Great British Bake Off" smashed viewing records Wednesday, with a peak audience of 14.5 million people tuning in to watch three finalists bake their "showstopper cakes." Over the episode as a whole, 13.4 million people were watching at any one time. For comparison: the most watched program in CNN's history, the prime time GOP debate last month, attracted 23.1 million viewers. The stakes might be low -- the champion baker wins a glass cake stand -- but the emotions run high. Tears, hugs, and dramatic mood music are staples of the show, which takes place in a marquee in the English countryside. Last year's ultimate "Bake Off" was the second most watched British TV program of 2014, trailing only soccer's World Cup final between Germany and Argentina. Its format has changed little over the past six seasons: 12 amateur bakers go through a 10-week long emotional rollercoaster, completing three culinary challenges each week. They are judged by a professional baker and a cookery writer, and each week one of them gets eliminated. There's a lot of sobbing, but almost no swearing -- the contestants are remarkably nice to each other. "Bake Off" is so popular that celebrities and even politicians often weight in on the contest, endorsing their favorite bakers. Wednesday's winner Nadiya Hussain was the public's favorite -- even the Prime Minister David Cameron said he wanted her to win. She cried when crowned champion. The show has had its share of scandals too, such as when one of the contestants decided to trash his Baked Alaska when the ice cream failed to set. The incident was dubbed "bingate" by British tabloid newspapers.